I've suggested as much in various posts since my Xbox 360 arrived a few weeks ago, but in case those casual remarks slipped right by you, here's the deal: I'm completely addicted to Pac-Man Championship Edition. Honestly, it's impossible for me to play this mode just once. That's what I mean to do, at least on most occasions, but invariably I end up telling myself, "just one more time," as soon as the game's clock hits zero. Despite all of the time I've put into Pac-Man Championship Edition thus far, I'd hardly call myself good at it. I improve a little each time I boot it up, though, which is part of what keeps me coming back for more. The other part? It's simply a blast to play--even when I miss my high score by a wide margin. I'll post more in-depth impressions of the game (likely in one of my "somewhat gay" reviews) soon, but in the meantime just know that I'm enjoying the hell out of it and that I heartily recommend it to anyone who has a PSP or an Xbox 360. Ah, another Pac-Man CE fan. Great! 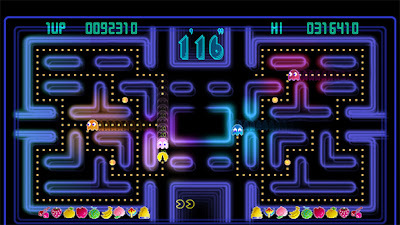 I definitely plan to buy the Pac Man/Galaga game when it comes out...but who knows when that will be. Well, hopefully it'll be out soon. Or, like I said, maybe they'll put Pac-Man CE on the 3DS shop after it's launched. I can see you liking this one, Simon -- it's kind of the perfect marriage of old and new.